For supported institutions, Koku allows you to connect directly to your savings, checking, and credit card accounts and retrieve transaction information. If your institution isn’t supported, you can import QFX and QIF Quicken Files as well as Open Financial Exchange (OFX) and Open Financial Connectivity (OFC) documents; you can also export your records to OFX. When you import transactions, Koku automatically tags them with informative labels like “music,” “services,” and “restaurants.” You can add your own tags or quickly search by description or tags to narrow down specific types of transactions. If you favor a more visual approach to your money, you can create charts that break down your types of spending, track your spending history by month, or display a summary of your accounts. Koku even includes its own Dashboard widget in case you want to keep a close eye on your finances without opening up the program. As a brand new app, Koku might not necessarily have all the features as more venerable programs like Quicken—but then again, these days even Quicken doesn’t have all the features of the Quicken. 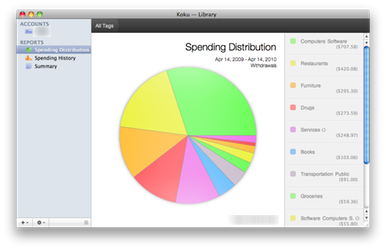 Koku requires Mac OS X 10.6 or later and currently costs $25 as a limited-time introductory price. There’s also a free trial that limits you to one account.